Here is the screenshot that LG took from The Work and the Glory: American Zion trailer. 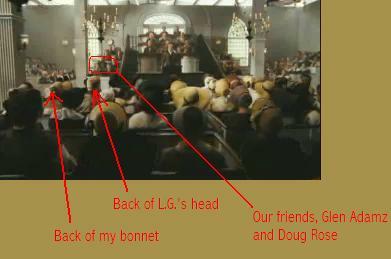 As you can see, we were there as extras in the Kirtland Temple Dedication scene. It was a grueling day of wearing 18th century costumes in a 100 degree warehouse, and look we got the back of our heads in the film! WOO HOO!